Customer Service: Customer service employees answer inbound and outbound calls. No cold calling or telemarketing is involved in this position. Premium Auditors: Phone auditors perform premium audits for Property and Casualty insurance. These audits are strictly conducted over the phone. All documents and materials are entered via ARO websites. Sales: Sales Representatives are responsible for maximizing sales and growth of the insurance and finance service division. To apply to be a remote employee, visit the career section of the ARO website. After your information is received, you will get a confirmation email. ARO hires across the 50 states, but may not always have positions available in all locations. You must meet certain home requirements and qualifications to be considered for any position. If positions are available in your area, you will receive another email inviting you to complete and application and phone interview. If your interview is a success you will be asked to join the ARO team. Training is completed at either a corporate location or via the internet. This training lasts for 3 to 8 hours per day for approximately 6 to 10 weeks. (Depending on the client you are working for) Training is paid at the same hourly rate that your position pays. 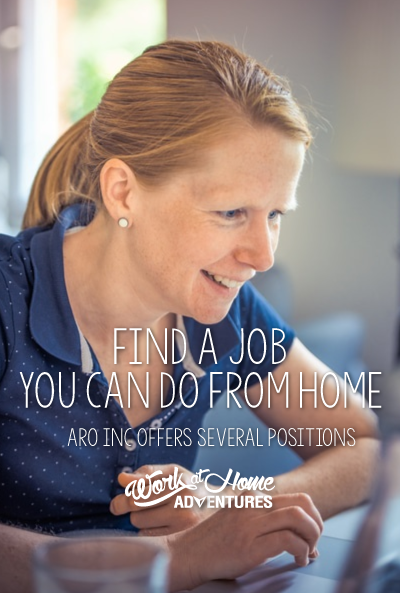 Scheduling at ARO is not as flexible as some work from home positions. All shifts are on a set schedule. Although this means there is less flexibility, it often means there is a higher level of stability. This is important when your income is relied on, especially to ensure bills are paid on time. These shifts will vary depending on the client you are working for. Both part time and full time work from home employment opportunities are available. Pay rates are not listed for ARO, and will vary depending on the client you are working for. You must have high speed internet to work from home for ARO. As with nearly all home based call center jobs, you will be required to have a quiet work area, as clients are required to have noise-free backgrounds while working. ARO does not provide any equipment or computers. There are a few reviews from past/current employees of ARO at Glassdoor. These reviews are pretty neutral, rating their experience a 3 out of 5 stars. The overall vibe I feel from the reviews I have looked over, is that it is a company trying but still has flaws. The reviews at Indeed are similar. However, there are more of them and they give ARO a 3.8 out of 5 stars. Great review Miranda. Thanks for sharing all this information. I’m going to pass this on to share with others who are looking for work. Hope it’s been a great day.